Click here for a Columbia County map. It has been said that all roads lead to Portage, a great thing for the local population of 10,000, the regional population of more than 55,000 and the many visitors who come to our city each year. Portage is about 35 minutes from the state capital of Madison, 90 minutes from Milwaukee and about three hours from Chicago and the Twin Cities. Transportation in Portage includes a cab service, a municipal airport, Amtrak, and an interstate and highway system. Interstate Highways 90/94 and 39 lie just outside of town. Travelers from Milwaukee, Chicago, and beyond can use I-90/94 to get to the Twin Cities and further west. Take I-39 to reach industrial destinations on the upper Wisconsin River and vacation spots further north. U.S. Highways 51 and 16 pass through the city and intersect State Highway 33. A cab service in town operates 18 hours a day and a free van service shuttles seniors who are no longer able to drive. The Snow Shuttle Xpress operates during the winter months and makes runs from Cascade Mountain to various locations, including hotels, in Portage. The local Amtrak station serves rail passengers traveling throughout the nation. “Traveling daily between Chicago and the Pacific Northwest along major portions of the Lewis and Clark trail, the mighty Empire Builder takes you on an exciting adventure through majestic wilderness, following the footsteps of early pioneers.” The Canadian Pacific Railway mainline provides rail freight service. 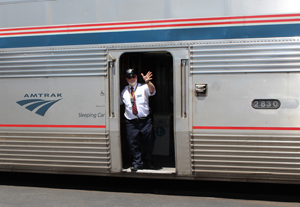 Click here for Amtrak depot parking information. Access to Greyhound bus service can be gained through Lamers Bus Lines in Portage with stops at the Mobil Travel Plaza, 2725 New Pinery Rd., and the Portage Amtrak depot, 400 W. Oneida St. Click here to make your reservation or call 866-552-6377. Private and chartered planes utilize the Portage Municipal Airport, featuring a lighted 3,800-ft. runway that is just a short walk from several restaurants and motels, with taxi service available. During the EAA World-famous Fly-in at Oshkosh, Air-Portage Inc., the flight based operator, provides a coach shuttle bus to and from Oshkosh. To contact the airport operator, call 608-742-3300 or visit www.air-portage.com, or email poppy@air-portage.com. The Dane County Regional Airport, just 35 minutes from town, offers flights from carriers such as American, Midwest Express, Delta, Northwest, United and TWA. Our prime location near major commerce and tourist centers in central Wisconsin, including Wisconsin Dells, Baraboo and Madison–along with the relative short distance to major midwest hubs such as Milwaukee, Chicago, and the Twin Cities–make Portage especially attractive to new business and industry.